You'll be £15.00 closer to your next £10.00 credit when you purchase Guardsman and Commando. What's this? 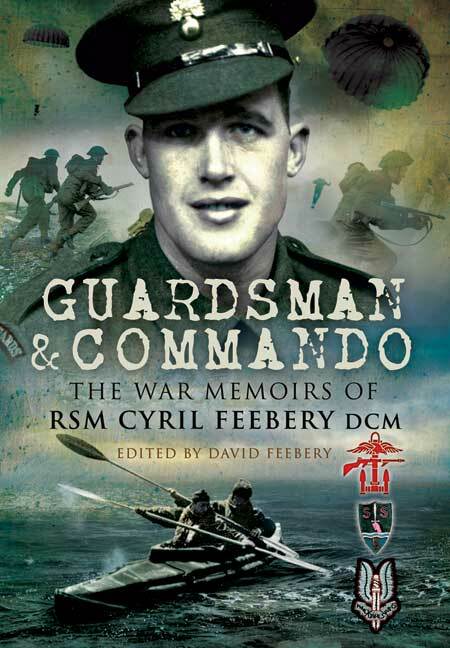 Guardsman and Commando is Cyril Feebery's memoir of his service with the British Army between 1937 and 1945. Feebery served with the Grenadier Guards in the British Expeditionary Force, was evacuated wounded from Dunkirk, completed Commando training in Scotland an joined the Middle East Commando (Layforce). On the disbandment of Layforce, he joined the Folboat Section, later the Special Boat Section, and trained as a canoeist under Captain Roger Keyes VC to conduct commando operations from submarines. When the SBS was later absorbed into the Special Air Service (SAS), Feebery took part in raids on Benghazi and Tripoli.With the creation of the Special Boat Squadron (SBS), Feebery served as Squadron Sergeant Major under Major the Earl Jellicoe. He has captured by Italian forces after a raid on airfields in Sardinia, and later escaped from Prisoner of War camp in Italy to regain the Allied side. After recovering from malaria, Feebery became Squadron Sergeant Major, Headquarters Squadron, 1st SAS Regiment in 1944. He participated in SAS operations in the Dijon area of France, then in Northern France and Belgium. The manuscript concludes with SAS operations to obtain the surrender of German occupation forces in Norway.